The University of Central Florida continued their winning streak Thursday night against Temple for the Knights’ Space Game and knocked off the Owls from the AAC East’s first-place podium. UCF hasn’t played in two weeks, and quarterback McKenzie Milton in three, yet the time off couldn’t have come at a better place in the season, staff said. Milton was on the receiving end of several hits in the Memphis game that led to his first bench in 27 games when traveling to East Carolina. The Heisman hopeful didn’t feel the impact until later on when the game-time adrenaline wore off. Head coach Josh Heupel kept Milton’s condition under wraps until Thursday when the crowd saw a number 10 jersey take the field, which was met with a standing ovation. One could speculate Milton would play all along, and Heupel simply made a clever sleight of hand. When the clock ran and UCF took the field, Milton made quick work of the first drive with four plays for 86 yards and a touchdown, however, the rest of the half didn’t keep pace. Temple outmatched the Knights to keep the lead 34-28 after two quarters. A couple of penalties (8-82 from Temple) and crucial tackles from the UCF defense kept the score from widening as far as it could. By halftime, the Owls had 445 total yards up against 363. 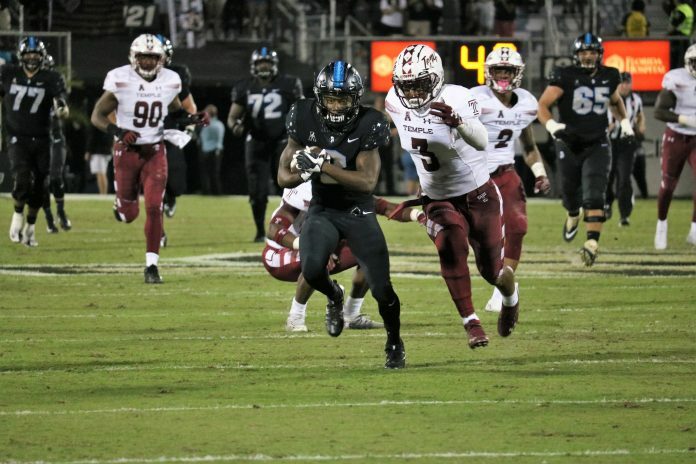 Once again, halftime adjustments reared again and produced a 24-6 scoring run from UCF offense and repeated tackles and sacks from the defense to burn Temple at both ends. Stay tuned for the full game story.